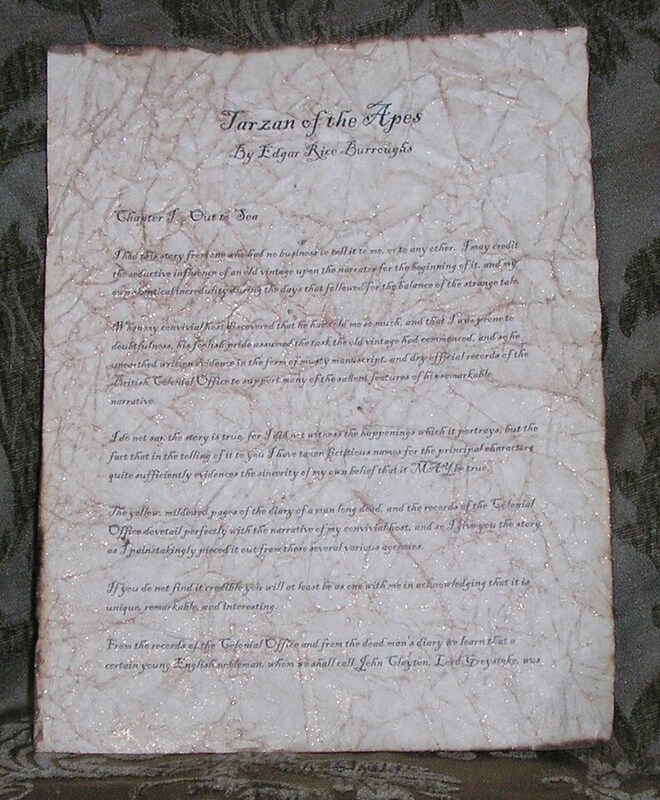 Tarzan of the Apes can now be remembered and cherished with this antiqued copy of the first page of Edgar Rice Burroughs's classic story. Whether framed on a wall or used as part of a centerpiece, this beautifully aged paper will be loved by any Tarzan fan. Our four step aging process transforms regular paper into paper that looks hundreds of years old. Although it's difficult to see in the photograph, there are very small shimmers of gold in the finish of the paper giving it an almost magical look. It not only LOOKS antique…but it FEELS antique, as well! Although it's difficult to truly catch with a camera, the second image reveals that there are subtle veins of shimmering gold worked into the page for a truly special look! The page is 8.5 " x 11". Makes for a great gift! See ALL of our classic literature pages in our store!